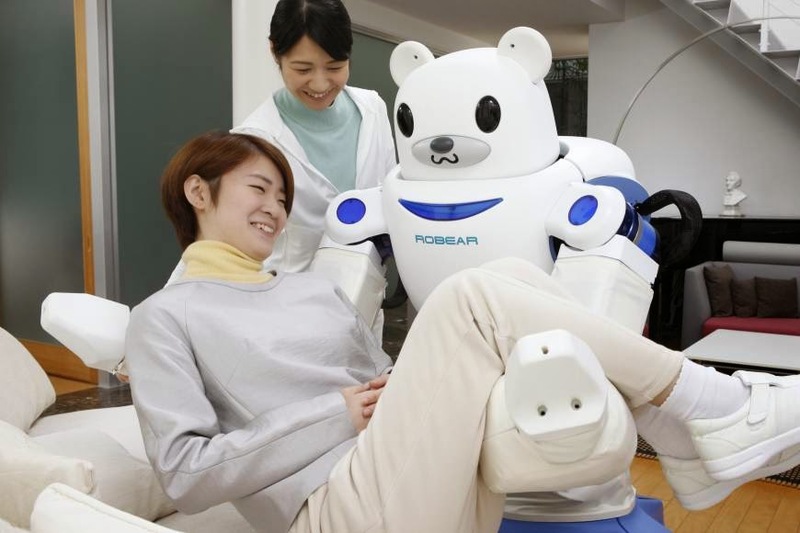 Forget the frightening androids of dystopian sci-fi, the future of robots is cute polar bears that can lift elderly people into and out of bed. The Robear has a cublike face with big doey eyes, but packs enough power to transfer frail patients from a wheelchair to a bed or a bath. A reluctance to accept large-scale immigration means an increasing reliance on robots, especially to perform physically difficult work. This frequently combines with Japan’s love for all things cute, producing machines with disarming faces and childlike voices. “As Japan is aging with fewer children, the problem of a shortage in caregivers for the elderly is getting serious,” Riken said in a statement. “Expectations are high that robotics will help resolve this problem,” it said. Deep in the bowels of a secluded facility outside the central Japanese city of Nagoya, a team of dedicated researchers has been working on a monster. It’s a primal, animalistic robot that uses advanced technology to power its intelligent vision, flexible movement, and giant arms strong enough to lift a human right off the ground. It could have profound implications for the relationship between man and machine. But perhaps most importantly, it is very cute. Meet Robear. It’s a high-tech teddy with a mission: helping make elderly care much easier in the future. Robear is the brainchild of Toshiharu Mukai (above left), an affable scientist who has been leading his Robot Sensor Systems Research Team at the Riken-SRK Collaboration Center for Human-Interactive Robot Research since 2007. It’s actually Mukai’s third robot bear, following 2009’s RIBA and 2011’s RIBA-II. Why the ursine fixation? "Bears are powerful and also cute," Mukai tells me. “The polar cublike look is aimed at radiating an atmosphere of strength, geniality and cleanliness at the same time,” research leader Toshiharu Mukai said. “We voted for this design among options presented by our designer. We hope to commercialize the robot in the not-too distant future,” he added. A historically low birthrate and ever-increasing life expectancy means Japan’s population of elderly is growing, while the pool of youngsters to look after them is shrinking.